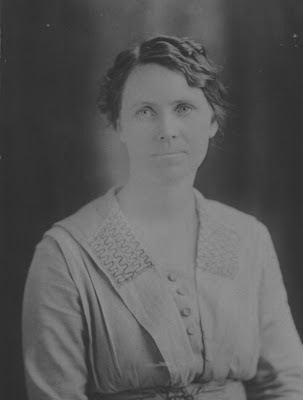 Rebecca Isabelle "Belle" Larkey was born 24 Sep 1885 in Scott Co., VA and died 15 Jun 1968 in LaHarpe, Allen Co., KS. Belle was the daughter of Robert James Larkey and Margaret Emmaline McClain. She married John D. Welch on 16 Jul 1927 in Buffalo, OK. He was born 17 May 1878 in Jonesboro, TN and died 25 Sep 1947 in LaHarpe, Allen Co., KS. Belle and John are buried in LaHarpe Cemetery, LaHarpe, Allen Co., KS. 29 Jun 1958, "I would like som more comfort, but ine things I have no use for. Unless they are fine things of the soul. People have gone 'things' crazy. Thse things were foretold - so to come."